The Apostle John the Evangelist, the son of Zebedee, was the brother of Jacob. Just like Peter, Andrew and Jacob, his brother, and Zebedee, their father, fished. He also listened to the sermons of John the Baptist, and was considered his disciple. Along with Peter and James, he was among the first called and closest disciples of the Lord, and was considered a pillar of the church. Among the closest disciples, John was present at the important events of the ministry of the Son of God on earth. He accompanied the Lord at the resurrection of the daughter of Jairus, on the Mount of Transfiguration, in the Garden of Gethsemane. John followed Peter with the arrest of Christ to the house of the high priest Caiaphas, and, using his connections, even entered the courtyard. The young apostle witnessed the tortures and interrogation of the Son of God. John accompanied Christ to the very end, during the procession through the streets of Jerusalem, along with the women, stood at the cross on which the Savior was dying. Just before his death, the Lord entrusted the cares of the disciple Mary, his mother. He was one of the first to witness the resurrection of Christ when he saw an empty tomb. Often in missionary travels, John accompanied the Apostle Peter. The New Testament includes five books that are believed to have been written by John the Theologian – the Gospel of John, the Three Epistles and the Separation. According to the legend, John preached in the cities of Asia Minor, in particular in Ephesus, then was brought for trial to Rome, was sentenced to death, but miraculously escaped – he did not damage the bowl of poison that he drank, and did not perish in a cauldron with boiling oil. Then the apostle was exiled to the island of Patmos, where he received and recorded for the succeeding generations a mystical Revelation. After exile, he returned to Ephesus, where he lived to a very old age. The only one of the apostles, John, escaped martyrdom. Traditionally, John the Theologian is portrayed in the image of a pretty young man with long wavy hair. Its usual attributes are a book or a scroll, an eagle that was sometimes depicted with a pen or inkwell in its beak. Also to the frequently used attributes of the Apostle John is the cup in which the snake is. Less commonly, the Apostle John is portrayed as being in a cauldron with boiling oil, or in the form of a gray-bearded bald old man. El Greco repeatedly portrayed St. John: both in the series of Apostolados, and in the images of the saints in pairs, in the Garden of Gethsemane, and in the mystical “Withdrawal of the Fifth Press.” He reproduced the saint in the guise of a young man with a pile of chestnut curly hair, with a narrow nervous face. In the hands of John holds a chased golden goblet, in which there is a miniature winged dragon. And if in written just a few years earlier a picture of the same theme, stored in the Prado, John the Theologian is written in a warm palette, in the image of a teenager, against the backdrop of a stormy sky. In a later version of the picture, included in the series Apostolods, John is depicted at an older age. This canvas produces a more disturbing, even gloomy impression. The deathly pale, emaciated face of the young man seems to read the imprint of suffering and that mystical world of visions into which he sank while on the island of Patmos. 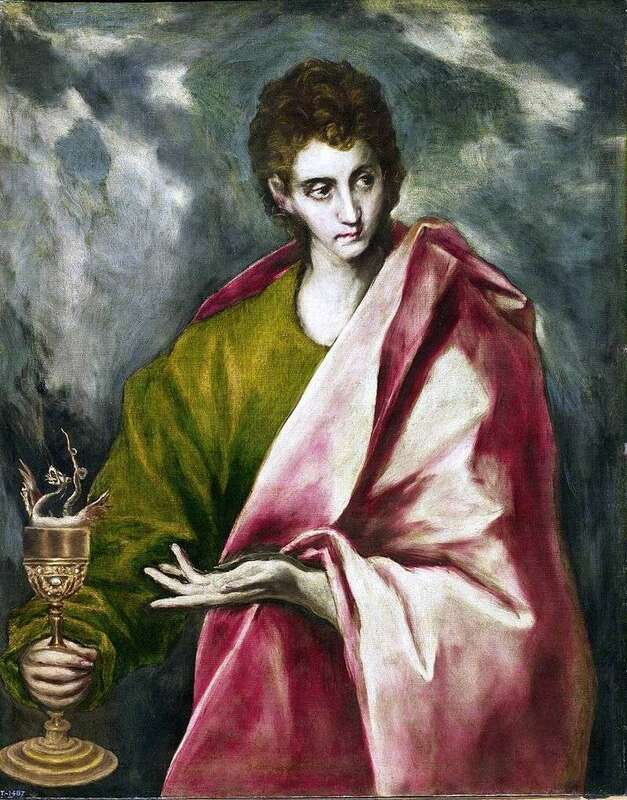 Description and meaning of the painting Apostle John the Evangelist by El Greco.